For as long the internet has been around, many have viewed it (and rightly so I think) as a wide open expanse of real estate. Some would say an every growing world of real estate with new top level domain suffixes (TLDs) and country specific domains as more nations come online. Others would argue the best ‘land’ in domain world has been consumed a long time ago and you have empires built in some areas and ruthless squatters and speculators elsewhere looking purely to flip domains others want for practical reasons for profit. 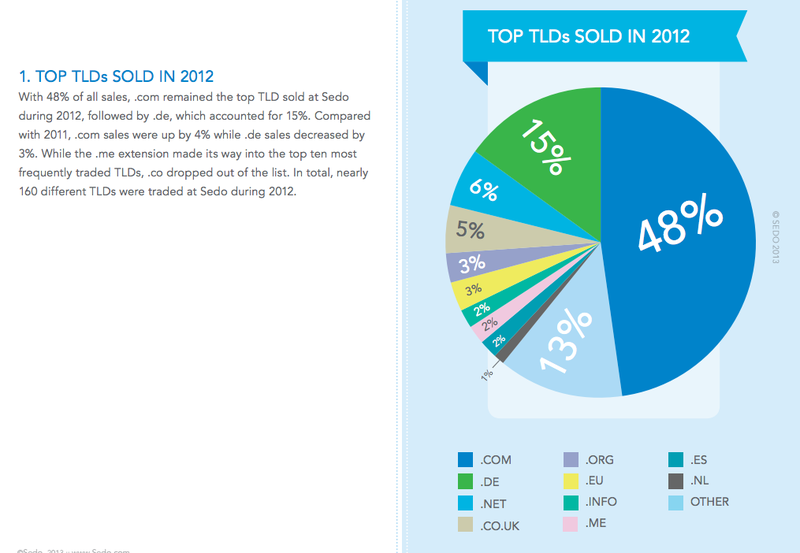 Let’s maybe start our discussion by looking at some data of the Top TLDs sold in 2012. By that we mean the proportion of .com, .net, .org, etc. domains sold around the world. This data is from Sedo one of the largest global marketplaces for domain buying and selling with about $70M in domain sales in 2012. What is immediately apparent is the large skew towards .com domains with almost half of all sales. Sedo originated out of Germany with also a strong presence in the UK so there is a bias for the data to skew to Europe (i.e. .de being second at 15% of sales). However sales in the US are still the most of any country at 28% of all sales. Now what does all this tell us so far, well that domains that have been there for the longest like .com, .net and .org along with the major country ones like .de and .co.uk still today dominate total domain sales. In face the only two TLDs in this list that are more recent are .info and .me although a portion of the ‘other’ sales would also be newer domain types like .biz and .name but realistically this entire group only represents maybe 5% of all sales in this chart. The other point of note from this chart and mentioned by Sedo is the lack of presence of .co domains. The .co domain name existed mainly in country form (i.e. .co.uk, .co.nz, etc.) for a long time but in 2010 was relaunched and people were allowed to buy domainname.co. As they were selling domain names from one letter onwards (i.e. t.co) this was seen as like Columbus discovering the New World as finally here was a chance for people who were too late or young for 90s Internet domain landrush to take advantage of a domain name that sounded most like .com and get a nice short name at that. Now 3 years later .co has largely gone nowhere. Twitter uses it for url shortener and Overstock.com briefly rebranded themselves as O.co but then switched back because of the confusion between .co and .com for users. That seems to be where we are with .co now, seems less like a New World and more like the discovery of Antarctica, huge landmass but not too much that can be done with it as it stands today. Before we make sense of all this let’s look at a final chart for additional context. 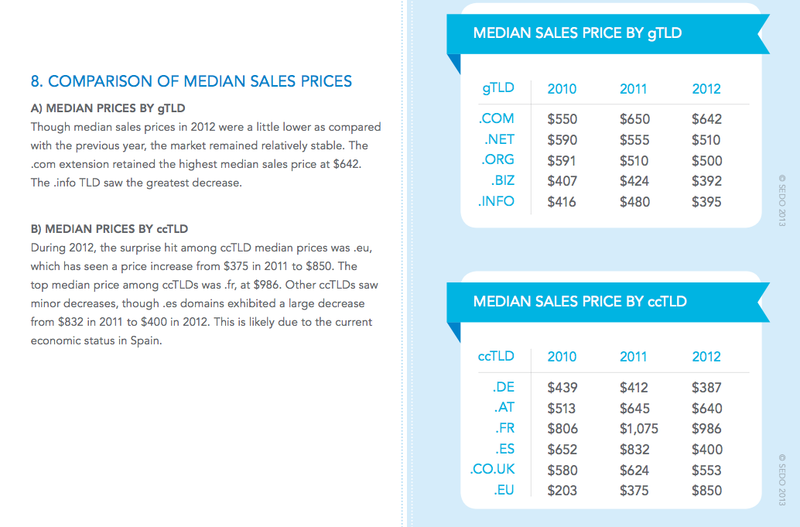 This chart also taken from Sedo covers the median sales price for various TLDs in 2012. The mean price can get skewed by a few major sales so hence the median is more valuable in assessing domain real estate relative values. Interestingly in 2010, .net and .org domains sold for higher prices than .com but in the past 2 years .com has been clearly the most valued domain name to buy. Their gap has widened against not only those domains but also the ‘newer’ TLDs like .info and .biz which are almost two-thirds cheaper. The country specific domains vary wildly but they are also more heavily regulated in terms of who can register the domain, the conditions for registry and usually higher prices and taxes due to all of that and less competition with domain registries. It would seem though in 2012 all the country specific domains took a price hit in contrast to the .eu domain (the .eu domain was only introduced in 2005). We started with the premise that the domain landscape is like the real estate market, and it is every expanding although some believe the best stuff is either taken or skyrocketing in price due to squatters and flippers. What is clear is that the most desired domains in terms of both volume and price are still the legacy ones; .com, .net and org. 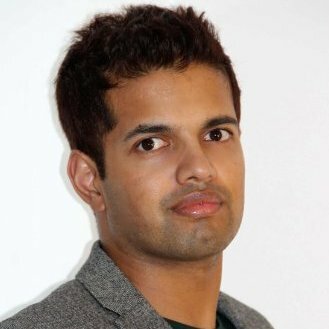 In recent times the skew in price has gone further to .com and could be also as a result of Google’s major algorithm changes since 2011 including Panda, Penguin and Exact Match Domain. The country specific domains are viewed as equivalent to “.com” in their respective nations. The reality is most dominant player in influencing this market is Google and they are doing it on two separate fronts. As the world’s dominant search engine (with some exceptions) and thus gateway to websites, when they make repeated major algorithm changes crippling tens of thousands of domains, it is the equivalent of someone building a toxic dump near your home. Your real estate value plummets as does the traffic and thus value of your domain. It has been said with anecdotal proof and cursory analysis over last 1-2 years that ‘.info’, ‘.biz’ and other newer domains were largely relegated to secondary level status meaning it was much harder for those domains to gain traffic. What is intriguing is this was predicted all the way back in 2000 when the newer TLDs were conceived and launched to help take the pressure of .com. New Scientist argued that rather than take the pressure of .com, it would actually make those domain names more valuable. What the author couldn’t have predicted at the time was the launch and ultimate success of Google AdSense which probably more than anything hurt the newer TLDs more than anyone. Speculators and spammers alike bought up these new domains often at promo level prices and flooded them with AdSense ads when it was more like the Wild West. So despite there being many major sites like MTA.info (for New York City’s public transit system), thousands of bad domains may have caused Google to poison the entire pool. On a separate front, Google with Android along with Apple and to a much lesser extent Microsoft have changed the game completely possibly rendering the web domain less valuable no matter what the form because of Mobile and in particular Apps. Since the launch of the iTunes App Store in 2008 and later Google Play and others, Mobile devices have surpassed desktop and laptop PCs in devices owned and used. Then more importantly Apps have fast become the major port of call on these devices occupying 80% of our time. Will there be a day soon where having a web domain doesn’t even matter and it is all about the App? The App and the Web Domain will operate hand in hand for a while yet just like websites and telephones but it may mean the end of million dollar domain name sales. The truth is that it still can be profitable to sell a domain if you have a legacy one with a short name or a name of value, a TLD for a country also that is short or a name of value and selling a domain along with a site/business of value. However the days of squatting on domains or hoarding the lesser demanded .info, .biz, etc. and hoping to make a large quick buck are probably gone. So if you have a portfolio of domains you want to sell that are probably average in their value then best sell them sooner and get what you can to cut your long term holding costs. Then again maybe Google might change their mind again and technology changes and hot-girls-4-u.biz might become valuable again! This entry was posted in Digital Media and tagged buy domain, domain profit, domain selling, sell domain. Bookmark the permalink.